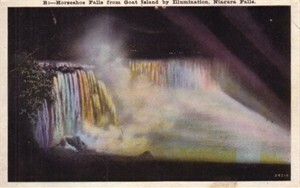 Original vintage Niagara Falls Horseshoe Falls from Goat Island by Illumination postcard. Horseshoe Falls was first illuminated in 1925 so this postcard is probably from around that time. NOT USED. Has three thumbtack holes, moderate corner wear and minor discoloration on the back. ONLY ONE AVAILABLE FOR SALE.